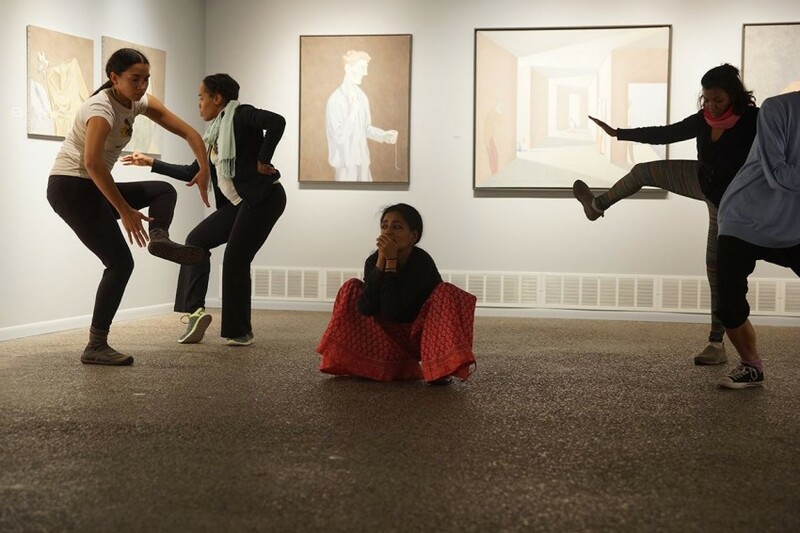 The Catherine G. Murphy Gallery at St. Catherine University provided the staging area for IN RESPONSE: An Open Rehearsal of Visual Arts shared by members of Ananya Dance Theatre and two visual art installations, Thursday, December 10. ADT’s dancers responded to the work of two artists, David Byrd, “War Is Always With Us,” and Jody Isaacson , “Form and Memory,” with a 50-minute movement meditation on violence, madness, and breath. 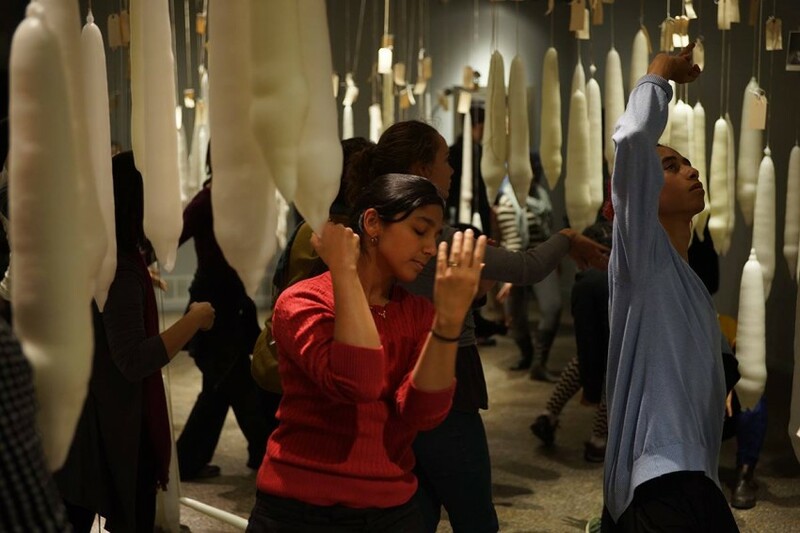 On arrival, audience members were invited to light votive candles on the gallery’s entry steps, and all eventually moved with the dancers among Isaacson’s installation of wax pendulums. Carol Lee Chase, Art/Art History Department Chair and Associate Professor, curated the installations. Her friend, Isaacson, introduced her to Byrd’s paintings. 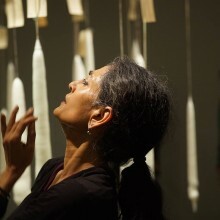 “Form and Memory”: Installation artist Jody Isaacson installs more than 160 hand dipped life pendulums from the gallery ceiling. Each wax form represents a person, now passed away, from Isaacson’s life. One dip for each year of an individual life accumulates into a candle pendulum that represents the time spent to remember each individual. Each relationship builds the installation, the artist’s life history currently suspended in the gallery. “War Is Always With Us”: For 30 years, the late David Byrd worked as a night orderly in the psychiatric ward in a Veterans Administration Medical Hospital in Montrose, NY. The series of paintings illustrate the daily routines and individual personalities of institutionalized veterans. Byrd’s careful compositions reflect the isolation and desperation of mental illness, which few other artists have explored with such empathy and understanding. The Catherine G. Murphy Gallery is located in the Visual Arts Building on the campus of St. Catherine University, 2004 Randolph Avenue, St. Paul. Gallery hours are M-F 8-8, S-S noon-6. “Form and Memory” and “War Is Always With Us” are open free to the public through December 18, 2015.